Steven Soderbergh’s return to filmmaking last year after a four-year hiatus didn’t exactly wow audiences as much as he probably would have liked, but whereas Logan Lucky largely underwhelmed in terms of overall memorability, his follow-up film Unsane will certainly stay on their minds a lot more. That’s partly down to how it’s been shot – entirely on iPhone video cameras – but also because this is a taut, chilling and highly suspenseful horror-thriller that has enough strengths to overcome its occasional silliness. The film is about Sawyer (Claire Foy), a young woman who’s settling in to her new life in Pennsylvania, having previously moved from Boston to get away from her deranged stalker. Haunted by visions of him, she signs up for a support group for like-minded victims of stalking, but soon finds that she has involuntarily committed herself to a mental institution, and is soon stripped of all her possessions and dignity, and then dumped amongst the other inmates. Pleas for help are ignored, and Sawyer is left largely helpless in a rather horrific situation – and to make matters worse, she firmly believes that her stalker (Joshua Leonard) is there in the hospital as well, posing as a member of staff. This is barely the first feature film to be shot on an iPhone – Sean Baker’s Tangerine immediately springs to mind as a prime example, as does the ending sequence to Baker’s The Florida Project – but it is by far the most technically ambitious. Soderbergh has always been the experimental type, particularly with some of his far lower-budgeted fare like Bubble and The Girlfriend Experience, and in this case he uses the limited capabilities that come with an iPhone camera to his advantage, because the grainy and ever-so-slightly pixelated video quality manages to add a sense of immediacy and down-to-earth grittiness that you don’t often find in common Hollywood thrillers like this. You feel so on edge as you’re watching Claire Foy go through one horrific ordeal after another, since quite a lot of it are intentionally shot like it’s by some creeper filming her from a distance, which give off the incredibly uncomfortable vibe that her stalker could be just mere feet away from her at any time, possibly even filming some of this voyeuristic footage. It’s a daring way to shoot this kind of movie anyway, but Soderbergh manages to make it work through camera angles, filters and sharp editing that wouldn’t be as easy to pull off with even a standard film camera. It’s also a fantastic acting showcase for Foy, who will completely blow you away if all you know her for is playing the Queen on The Crown, as she really digs deep into the character’s unbalanced psyche and will constantly have you questioning her better judgement, even in scenarios where it’s made clear she’s largely in the right. She has one or two looks on her face in the movie which suggest that, even if she isn’t as crazy as she is being led to believe, she may be about to snap at any moment and lunge out at whoever happens to be standing in her way. She easily carries this movie on her bare shoulders, and should prove most of the naysayers wrong about her casting as Lisbeth Salander in the upcoming reboot The Girl in the Spider’s Web, because by God can she act crazy and get away with it beautifully. This is a film that has a lot of strengths to it, not just the acting but also the technical aesthetics and tone that Soderbergh brings to the scenes of pure dread and terror, to a point where it clouds your judgement a bit on the plausibility of it all. There are certain things about it that really don’t make much sense once you start to think about them, which if I were to go into detail would spoil a large chunk of the movie, and the reveal as to why she is being held in the institution against her will is a little hard to swallow, as again it doesn’t sound like something that would exactly happen in the real world, especially when it’s filmed in a way that’s meant to mirror reality quite closely. In addition, the final ten minutes or so of the movie do tend to fall a bit into the stock stalker thriller tropes, and it ends a little abruptly without too clear a resolution when it stops to display the ending credits. 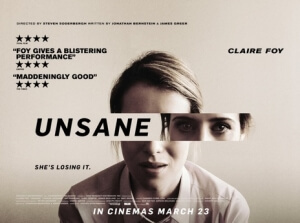 Again, though, as silly and implausible as it can be, Unsane does a decent enough job at making you forget most of that, because it’s a seriously frightening and unnerving thriller that’s tightly made, well-acted and scary enough to make you have a crazy good time. Unsane is an effective and disturbing stalker thriller that earns points for its ambitious filming techniques as well as an astounding lead performance by Claire Foy, which are enough to overlook some of its sillier aspects.